These days, at the advice of other moms who do home learning with their children, I simply teach JoyJoy when the opportunity presents itself. This works for us, I find that learning is spontaneous, fun and effective. I am not keeping track of whether JoyJoy is keeping up or more advanced than others of her age. 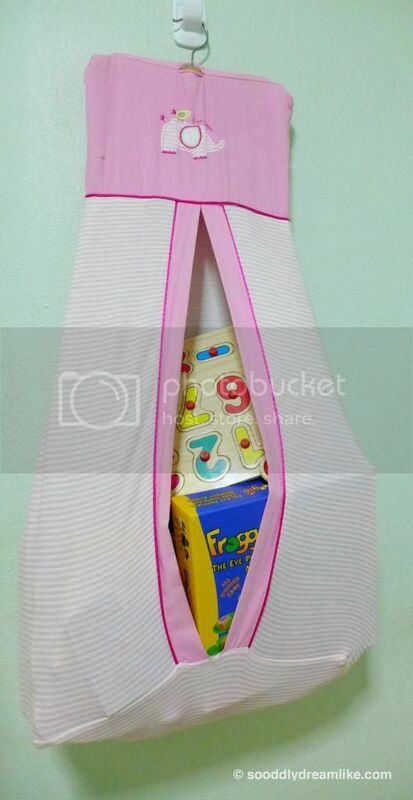 I do not also have a fixed curriculum for JoyJoy’s learning although I have a some materials on hand to use as and when I feel that the opportunity to use them presents itself. If I remember correctly, JoyJoy learnt to count from 1 to 10 in three languages at about 16 months old (she is about 19 months old today). 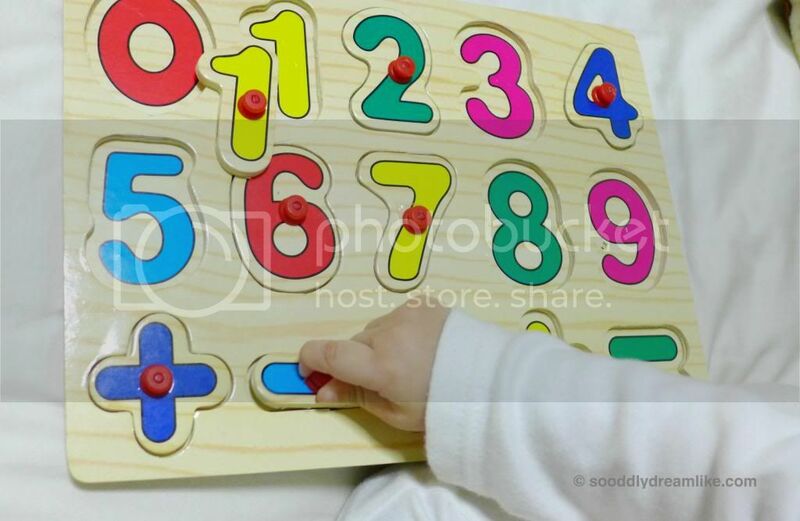 I wasn’t looking for a particular way to teach JoyJoy her numbers but it so happened that her grandmothers on both sides each accidentally taught her to start counting. My mother started it first when JoyJoy was about 14 months old, barely able to walk properly. JoyJoy loves to climb stairs and each time my mother taught the little girl to climb the stairs leading to our home, and also the one leading from our kitchen to the living room, she would say “一二，一二” (1-2, 1-2 in mandarin) as she climb each step. My mother also says “一二，一二” to JoyJoy sometimes when they march along as she brings the little girl for a walk around our place. JoyJoy started saying “一二，一二” whenever she sees a flight of stairs very soon after because she wanted us to bring her over to climb the staircases she happened to see. The only down side is that now, when she sees a flight of stairs, she says “Mummy, 一二三四!” or “Mummy! JoyJoy 一二，一二!”. JoyJoy’s paternal grandmother never went to school but she is someone who (like me), likes to say random things to the little girl. Mostly she chooses some phrase she coined herself but so happened, she decided to repeatedly count from 1 to 10 when feeding JoyJoy her meals, and she does it in three languages, English, Mandarin and Cantonese. Although her pronunciation is bad for many of the numbers, it worked to keep on repeating the sequence to JoyJoy almost everyday in her usual singsong manner, complete with head-nodding at each number. I correct JoyJoy each time I hear her pronounce it wrongly to avoid her having the wrong memory of how it’s supposed to be read. When we found her counting on her own in different languages, all of us started to count together with her, which made her even happier. Soon, we were counting as we go along our usual daily routine and sometimes, counting as we shop (JoyJoy counts loudly and proudly — I ignore people who stare). Before long, it became easy for JoyJoy to count to ten. I chanced upon this handcrafted board sometime ago when I was overseas. I like it that they were coloured brightly but yet not distractingly so. 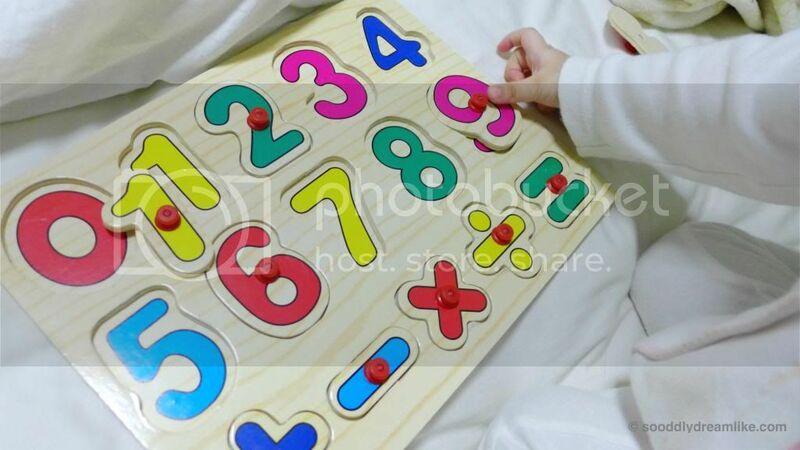 Plus, there were these knobs on the boards that are perfect for curious small hands and the best part is, when you remove the wooden pieces by handling the knobs, there is another print of the number on the board. The plus, minus, times and divide signs on the board was an additional bonus. When I came back home, all I did was to let JoyJoy play with them, without trying to tell her how to read each number. Initially, she played with it for a few minutes each time before losing interest completely. That was fine for me. 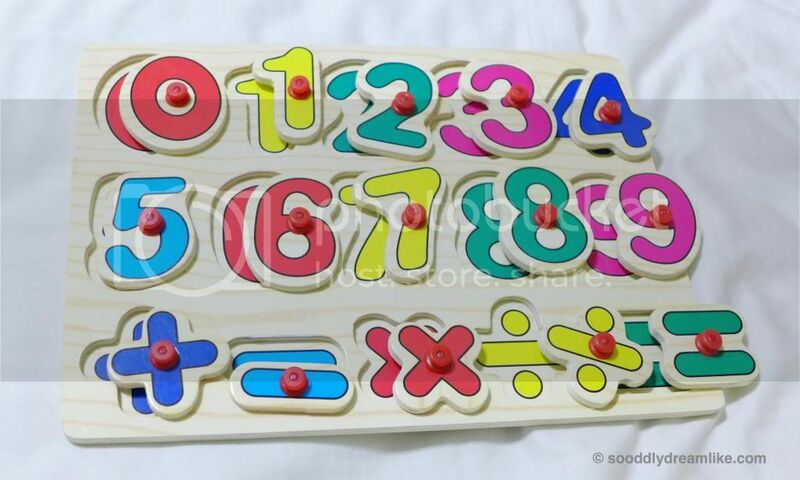 Recently, as it had been some time since JoyJoy started to count and she is familiar with the sequence, I started to use the board as a game during playtime. It was really easy since she loved to count. All I did was to count with her and point at the numbers as we count and allow her to remove the knob on each number as we go along. I make it like a treat for her to remove the knobs. In this way, each time we count a number, she sees the representation of that number two times to reinforce her memory. 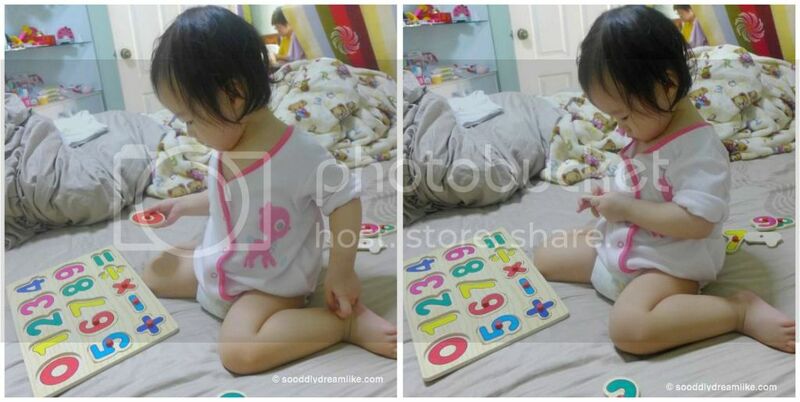 In the course of it, JoyJoy learnt to count “Zero” / “零” as well, which she didn’t learn when counting previously. After 2-3 sessions, she was sometimes able to match the correct number to its position. Very soon, she started asking me for the board, which I place strategically, each time she sees it. I’m really liking the board a lot (now I wished I brought 2, one for each of her grandparent’s home), especially seeing that JoyJoy thinks of it as a toy rather than a learning tool. I plan to do this for a while more before asking her to detach numbers from the board in sequence, follow by randomly to see if she can recognise the representation of each number and then moving on to teaching her beyond ten and using the board for other math teaching. Tell you how it goes when we get there!